All*Star Thursdays hold a unique place in our hearts because of the people―those who are fixtures, as well as those who wander through as part of their life’s adventure. The All*Star Thursday Guest Jammer Initiative brought in Berlin’s own Anton Capellmann, our final honoree of the season. 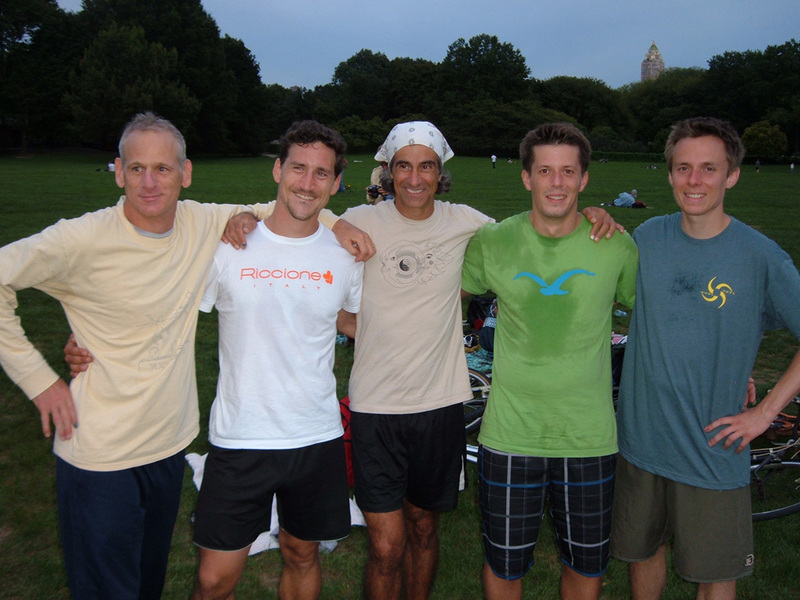 Last year our Invisible String friends brought The Big Throw to Sheep’s Meadow. This time around the Velasquez Brothers scheduled Jersey Jam Camp in nearby Morristown, NJ, making NYC the place to Bee! In all we had eleven (11) people who traveled by plane from Germany, Colorado, Florida, and Ohio to join us on our Green Beach September 15th. Attendees included the aforementioned Anton Capellmann, Phillip “Sleepy Jammer” Lenarz, Stefan Duenkel, Boguslaw Bul, Lizzy Leudicke, Christina Kunze, Bill Wright (our very first A*TGJI invitee), Larry “Laerbs” Imperiale, Sue Strait, Richie Regs, Vic O, Young James, JB, Bill Doobs, The Ageless Trevor Brown, Bradford T., Fresh, Jill, BenJAMin, Clare, Alan C. Kevin, Jaime-TJH, Joey, Mark ‘The Estivator’ Sebastian, Peter and Paul (The Accidental Tourists), Chuck, Young Daniel, Barak, TedShred n’ TLC, J-Will and Cele (sic? ), Alex, Robbie-Rob, and Chuck. That’s more than thirty people who came in to Jam with the Tribe. Wow! The sun was peeking out when I arrived on the big day, but hid its smiling face behind clouds for good shortly thereafter. Young James rolled in next, giddy with anticipation. He was followed in short order by Sleepy Jammer, Stefan, Young Daniel, Mr. Fresh, BenJAMin, Clare and Jill, with a surprise appearance by The Estivator. In a Cosmic Coincidence, two gentlemen came across the empty Meadow to join us. Paul and Peter are Plastic Peeps visiting from Germany. They heard through the grapevine that Sheep’s Meadow was the gathering spot for our brethren and sistren in flight. This was their lucky day, as they wound up joining us for All*Star Thursday, the after party at Chez Meier, and the All*Star Friday Jam as well. Two more additions to the Tribe! James, Stefan, and I commenced to Jammin’, as did Fresh, Daniel Sleepy, and Mark, just before it started to rain. Sleepy has improved tremendously since he spent a month with us in 2006, and Stefan has got serious game. Excellent throws, hellified Scarecrows, and plenty of hustle. We kept playing as Clare and Jill sat under my umbrella, and Ben practiced heckling his Dad. Rob rolled in about this time, making the executive decision to make that move to the Bandshell. The Flow in both Jams was excellent, but we all knew the shelter of our off-season home would be more welcoming, so we soon followed his lead. The rain continued as we walked over but our spirits were not to be dampened. There were already folks on the scene setting up shop inside the Bandshell, making themselves at home. Everyone was greeting, stretching, nailing up, and laughing. There was kind of a subtle hum in the air when the Rob and Daniel hit the hard concrete for the first Jam. Over the course of the next 107 minutes, there were a minimum of nineteen (19) distinct combinations of Jammers. Each one drawn to this place, at this time, united by a single thought: Most Fun Wins! These were the ones I was able to write down, and doubtless some were missed. At one point there we four separate minimum 4-player Jams going on at once. It was really amazing to stand up on the bandshell stage, seeing the space filled with Jammers and flying Stylers. My memory of play is a blur of Hein Highlights–flash images of people and plastic in motion, with lots of joyful noise echoing all around. All under the watch eye of the NYPD. Seriously. There was one lonely cop in a three wheeler who watched us for almost an hour. Their new motto must be Courtesy, Professionalism, Respect…and Shredding! The alchemy of Freestyle makes each Jam special in its own right. Jam of the Day Honors? Fuhgeddaboutit! There’s no way I can do justice to all of the happenings, even with my notes, and I don’t want to leave anything out. * That said, Stefan did nailed down the Combo du Jour. He did a wild and wooly combo off of a Daniel via TedShred set. He was treading on dangerous ground, tip toeing around Jammers, spectators, and the benches before finally sealing the deal with a CHOMP of a Vacation. S’Nice!!! * – I invite all attendees to share their thoughts about Jams they were in, those they observed, or funny moments on the All*Star Thursday blog, on Facebook, or send me an e-mail at tallpaul513@yahoo.com. My first Bandshell foray was an Old School Counter Jam with Richie Regs and Bill Doobs. These gents were two of my first ‘regular’ Jam partners due to spin preference. Flow came easy because we all knew how to set each other up for the best results. Something must’ve been going right because Daniel and Emma jumped in as a pair. Instant Mob-Op! We hit an O’Malley straight away, and Emma nailed a roll-brush to Gitis shortly thereafter. As for Daniel, he is growing into a Monster Shredder. He’s got spontaneous connectivity reminiscent of some of our crustiest Brethren, he’s hungry, and those young legs allow him to match anything he can think of with direct action. How about thigh brush, to spinning thigh brush, to 3 consecutive hop-skipping Turbo-Rolls, to spinning Lacer? Heinous! The Jam that folks talked most about was James/Bo/Anton/Fresh/Barak. Dougie is a player with marvelous disc-dexterity and a knack for setting up his partners. Bo and Anton play amazingly together, flowing naturally, while Barak and James are simply electric. Anton, the A*TGJI Honoree, is a very special player. Always moving, he has an uncanny ability to hit every brush, cuff, and mac so that the disc is wobble free, perfect for the next move. His backhand mac-throw sizzles as it slices the air, and his Scarecrow-brush is as accurate as a throw. Bo’s style is very subtle. His high difficulty moves are so smooth that when you roll the tape back, you wind up just shaking your head in amazement. James and Barak hit back to back No Bones Double Spinning Gitosis’, not to mention the former’s Bad Attitude and Olivia seals, and the latter’s very long Vacation. This Jam went well past Eleven. As darkness fell, Bill W. had a no see-um Jam, while TedShred, Forever Trevor, and Kevin were the Last Jam Standing. James was pacing around after his final foray and decided he wanted just a little more, so he jumped back into the action. No one really wanted the Jams to end, but the lack of light, combined with the promise of tasty beverages, pizza, and Robbie-Rob’s extraordinarily delicious bulgogi, made the transition a bit less painful. The party at Chez Meier was wonderful as always. Roger had a loop of Frisbee inspired pix that spanned from the 60’s through today, and screened a documentary of Freestyle from 1977 that Bill W. found hidden in his basement. It was a riot to hear the very serious voice of the narrator comparing Freestyle to ballet, and seeing how the producers included footage of all types of activities to give the lay public context for this new sport of Freestyle Frisbee. Mr. Wright also presented The Oracle with a disc and the original poster featuring his image that was used for last year’s tournament in Colorado. Very cool! The best part of all was the camaraderie. Groups of 3, 4, 5 and more, all talking about moves, co-ops, competitions, international connections, and a lifetime of friendships that have grown over the years. It felt like I was walking on air as I headed home on the subway. 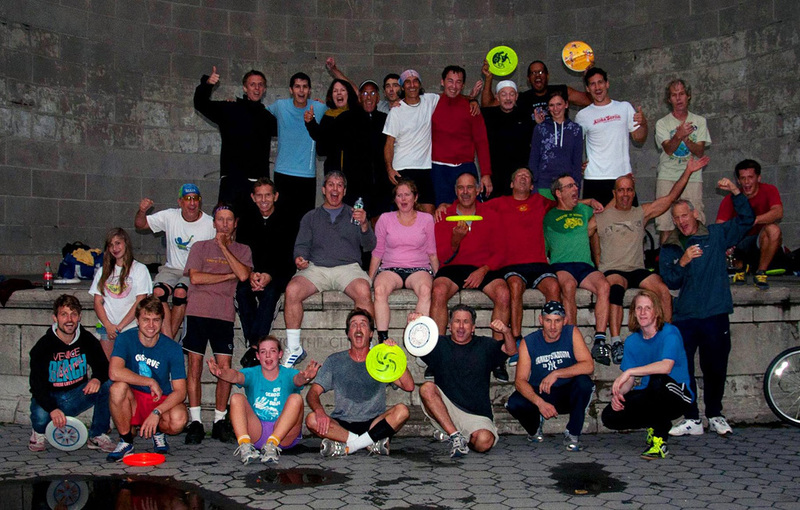 The Hard Corps of the Big Apple has become a wonderfully eclectic extended family. We’ve got Familia from around the world, who have become part of an ever expanding circle of loved ones. Special Thanks to Ted and Chrissy for serving as the catalysts that ignited this movement; to Roger and Tricia Meier for hosting so many people and gatherings, to Roger (again) for putting together the All*Star Thursday blog; to Chuck for having film in that camera; and to the rest of the Tribe for doing whatever it takes to make Jammin’ here such a blast. So, when are YOU Comin’ Down? Here are some vids from the Sunday post NY Jam-Camp Meadow Jams and a quick shot from jamcamp.